The touts outside Manchester Academy were having a tough time trying to flog tickets for this gig. Surprising too, because despite Alkaline Trio having some of the most loyal and die-hard fans in the business, the show didn’t sell out. With the venue nowhere near full at 8pm, Broadway Calls made a somewhat delicate entrance to kick things off. What followed was reminiscent of an early Blink-182, with moves and rhythm straight from the 1998 school of pop-punk. Huge support and movement from the crowd clearly encouraged the Oregon trio, who seemed to mature over the duration of the set. Watching Broadway Calls play first is akin to seeing a child ride a bike by itself for the first time. The vocals gained more depth from Ty, and Matt displayed skill on the bass. What started as a shaky start bloomed, and wound up very convincingly. Broadway Calls are well worth a listen, and are so family friendly, you can even play them with your mum in the car. Next up were The Audition, with their own brand of humour and style. Danny on vocals is the star here, demanding all eyes on him throughout the entire set. Refusing to let the hole in the crotch of his jeans put him off, he launches into a triade of acrobatics, flinging hair all over the stage. Their second song, Warm Me Up, which samples Cry Me A River continues the onslaught. All five members perform whiplash-inducing head banging, and you can see their genuine love for performing. The 2,000 or so now in the Academy love it too, and join in with the foot stomping bass and hands-in-the-air lyrics. The Audition deserved more time than the half hour they were given, especially as though they were the ones responsible for the high energy in the venue. The speed at which they performed caught up with them in the end, having played their entire set-list before their time was up. Giving their Mancunian fans a treat, what followed was a new song, previously unplayed on this tour. The crowd’s gift back, was the first crowd surfer of the night. Unfurling behind the drums is a huge banner reading “Agony & Irony”, the name of the new album Alkaline Trio are in the UK promoting. Drawing from their six studio albums in ten years, and a history dating back to 1993, the fans are set a set no fewer than 20-songs. Matt Skiba sings the first three behind a pair of Ralph Lauren sunglasses, seemingly unaware that it is now 10pm in the middle of February. Indoors. 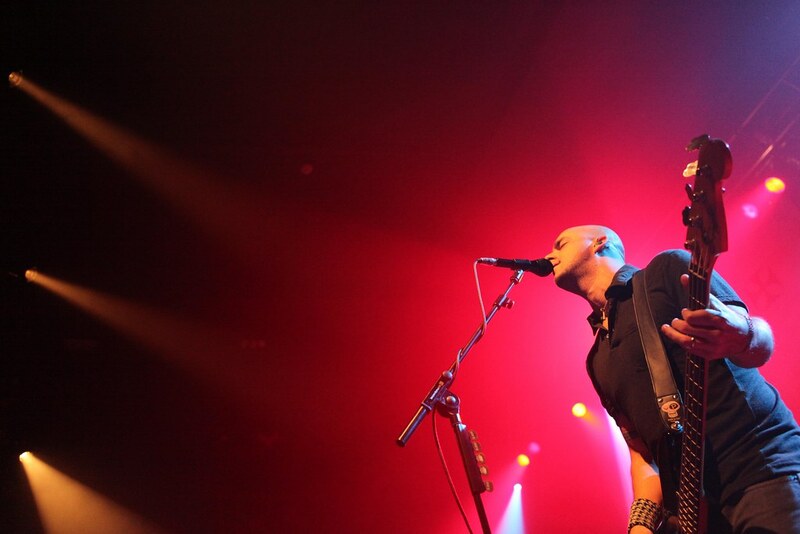 The depressive lyrics Alkaline Trio are famous for won’t sadden the crowd. Looking around, one not fan, most of whom sport either a Alkaline Trio t-shirt or tattoo (or both), fails to wear a huge smile on their faces. Performed with understated professionalism, their flawless yet mostly static performance pulls tens of crowd surfers over the top. All the way through to the end of the show, every word of every song is matched by someone in the pit who feels and believes the story. Metal horns are thrown with real passion, and the effortlessly cool trio take everything in their stride. Tonight wasn’t about Alkaline Trio. It was about their followers. After all, Alkaline Trio don’t have fans, they have disciples, and the way the band connects with each one of them is awesome. A feeling of brotherhood is shared between the crowd, and this is punk in it’s purest form.